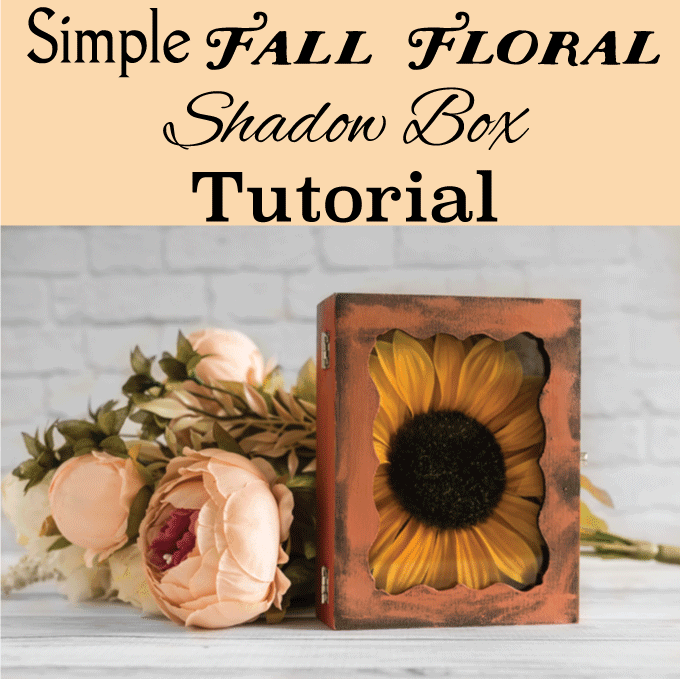 Last week I promised something that was neither beachy nor a vase, so here it is – an easy floral fall shadow box tutorial! 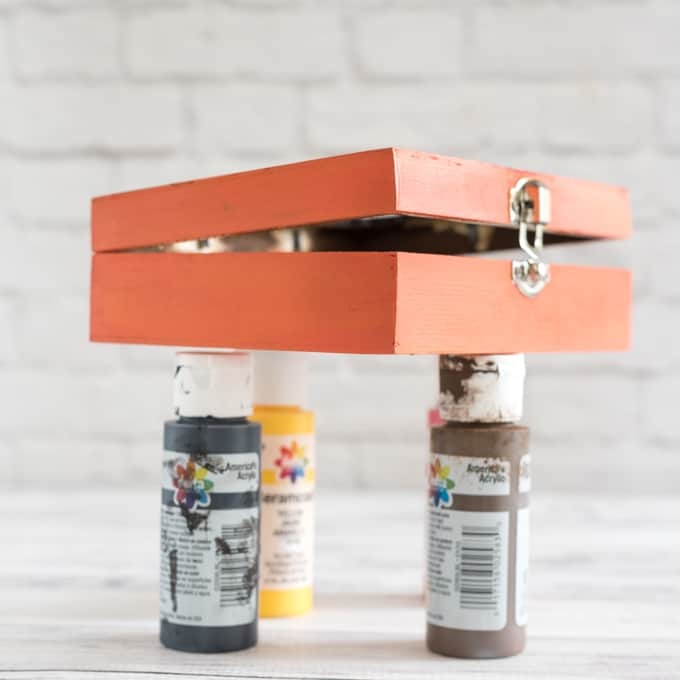 This project is a cute, simple way to add a touch of fall to your decor, and the project could easily be modified for other seasons. Funny story – I had this large sunflower stem sitting in plain view in the living room for about a week and, apparently, my husband didn’t notice! The first time he saw the completed shadow box on our bookshelf he said “O! 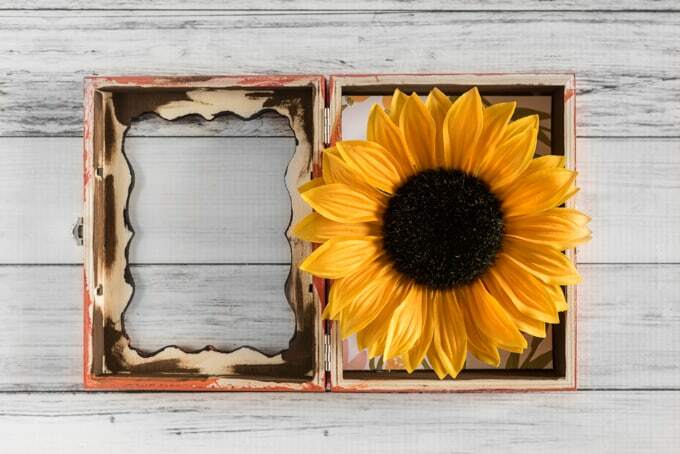 You got a sunflower!” I laughed and told him I’d had it for a week, it just hadn’t been displayed in a box. 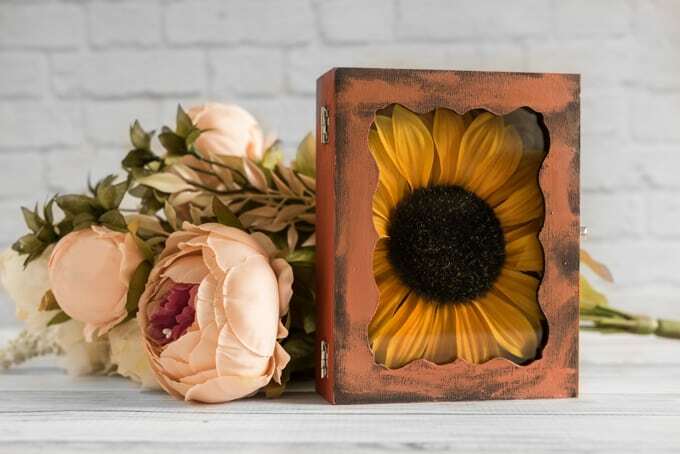 This project is super easy to customize, so go with whatever colors and blooms you like! A wood box! 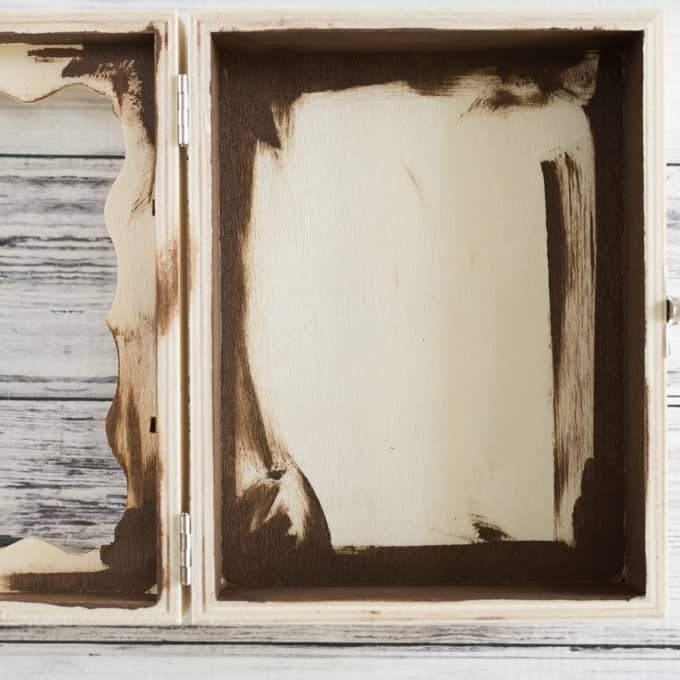 A box with a see-through lid, like the one shown, is best for this project, though you can always leave a box’s top off and have an “open face” shadow box, instead. 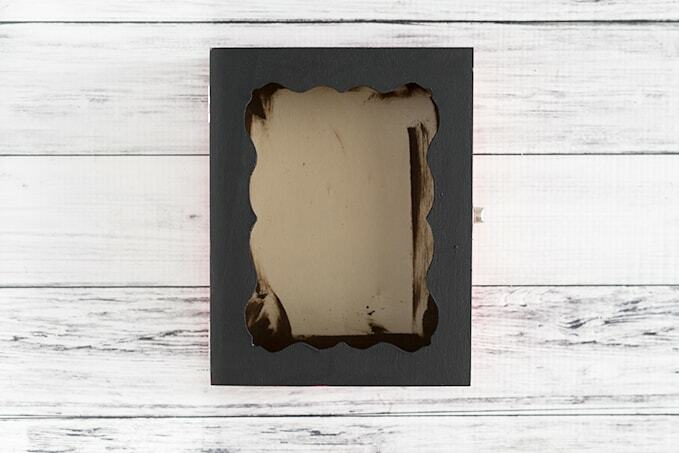 A frame-style shadow box like this one would work, too. 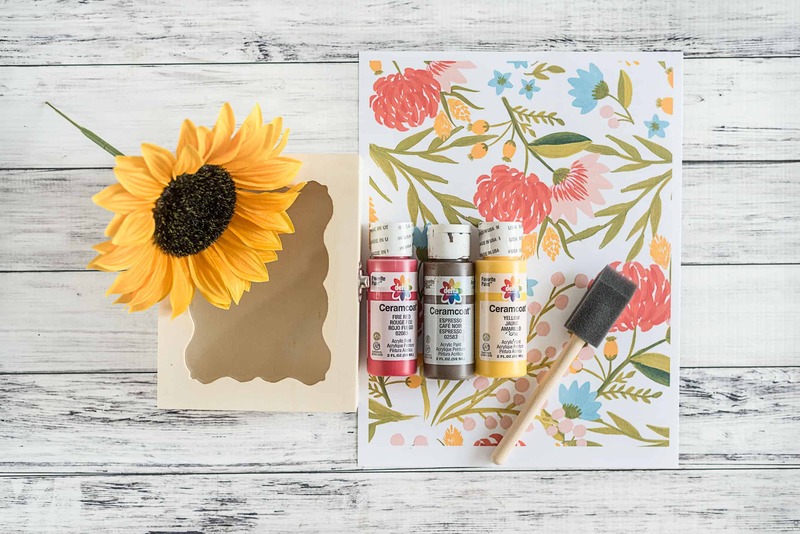 Craft paints in colors to complement your decor/flower. I highly recommend something dark, like brown or black, for the interior, and more colorful choices for the exterior. 2. 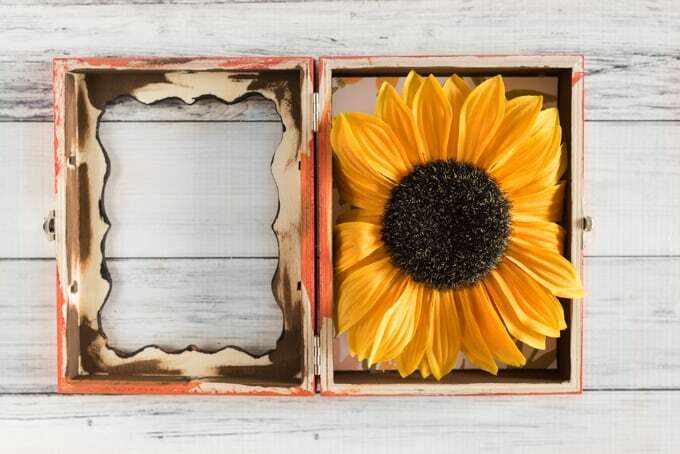 If you’re using a paper background, measure the inside dimensions of your box. 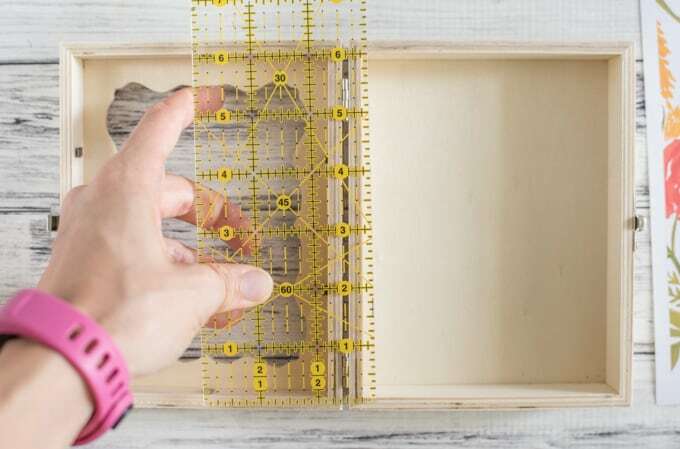 Your box probably has exterior dimensions listed on the label that annoyingly refuses to come un-stuck from the back, but it’s a good idea to measure the interior dimensions for yourself. 3. 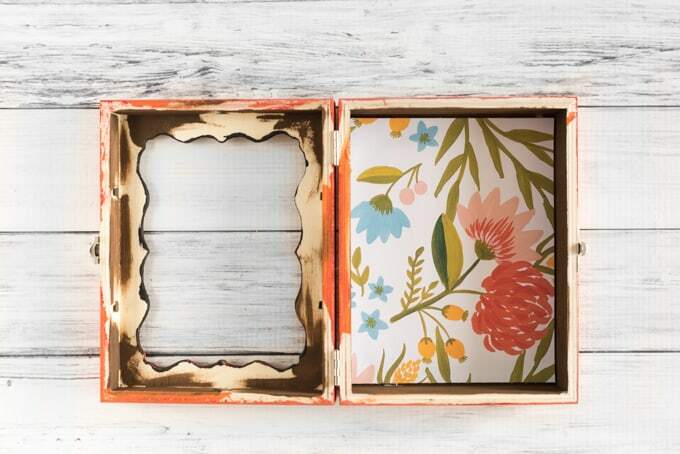 Either print the floral page provided here or cut your scrapbook paper to size, then test fit it. If it fits, go ahead and set it aside for later! If not, trim until it does. 4. Now it’s time to paint! Begin by painting the interior sides. If you’re not adding a paper backing, paint the bottom/back, too. 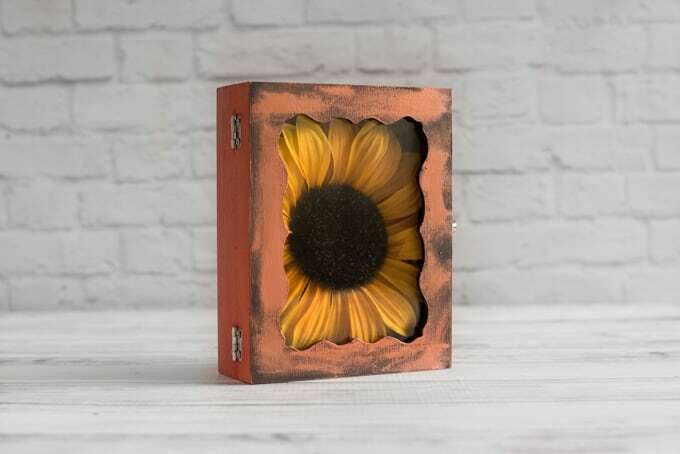 I used a dark color for the interior to make the sunflower petals really stand out, but pick your interior color based on your flower. 5. Next, paint the exterior sides. Be careful not to paint the box shut! I like to paint all four sides at once then prop the lid open and rest the unpainted back on my paint bottles until the sides have dried. 6. 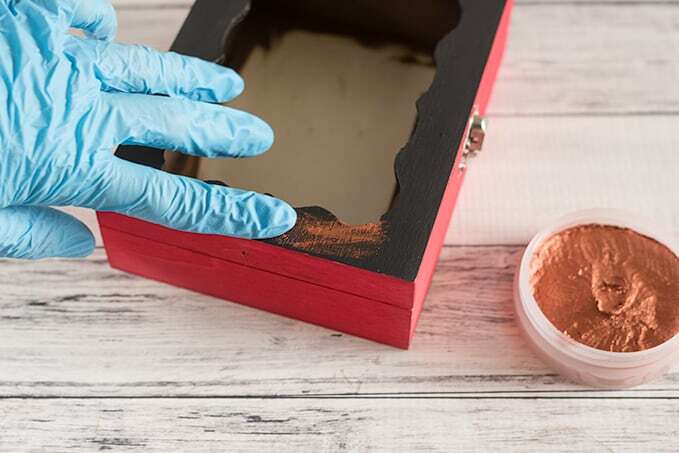 Paint the back, if it will be visible where you intend to display your shadow box. 8. Then black again. And again. After three solid coats were in place, I used Metallic Luster wax finish in Copper Kettle. 9. I just rubbed it on, against the grain, with my finger (in a protective glove, of course!). You can decorate or distress your lid however you’d like. 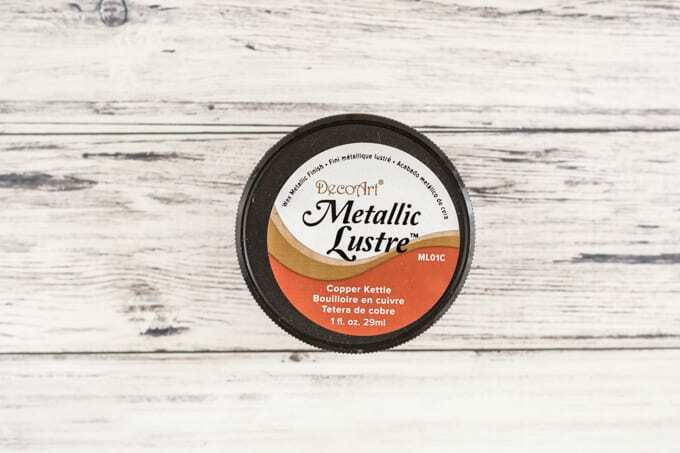 If you do use a metallic wax finish, make sure to apply several solid layers of paint or it won’t adhere well! 10. Once all paints are dry, go ahead and replace the glass pane. 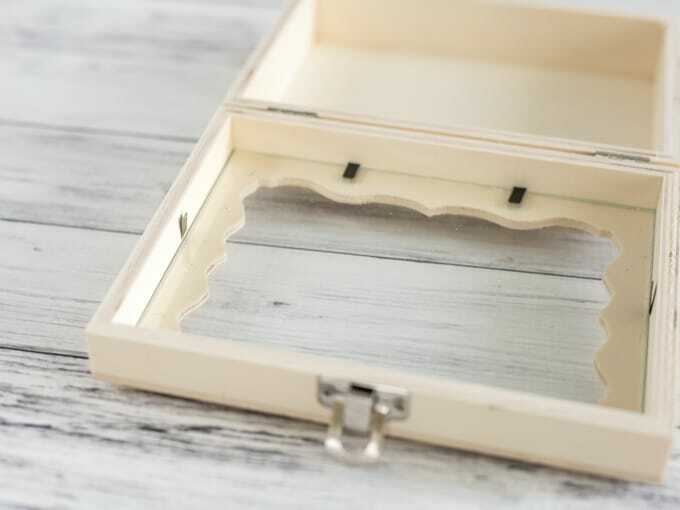 If you’re using a shadow box with a slide-in front and not a hinged box, save this step for last! 11. Now it’s time to grab your white glue or Mod Podge and secure the paper backing in place! I brushed some on with a paint brush then pressed the paper down. Super easy! 13. Test fit your flower in place. Some petals may stick out – that’s fine! If you’re happy with the flower’s height, you can go ahead and hot glue the stem in place, if you’d like. 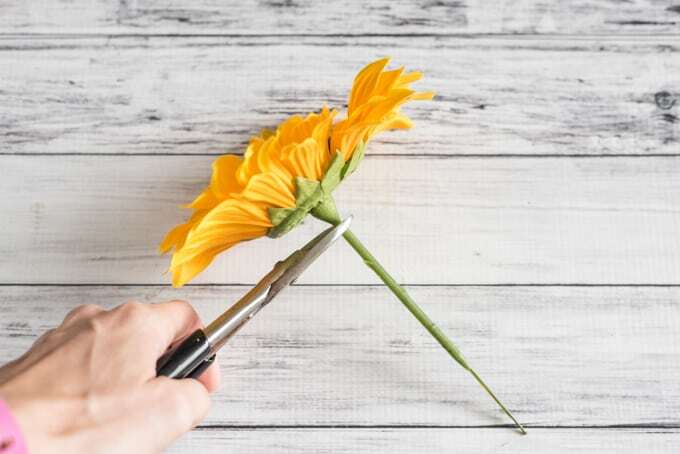 If the flower sticks up too much, just trim it down a little and try again. 15. Then close the box! If you are looking for fall projects, I highly recommend these tutorials and recipes. They’re consistently my most popular posts this time of year! 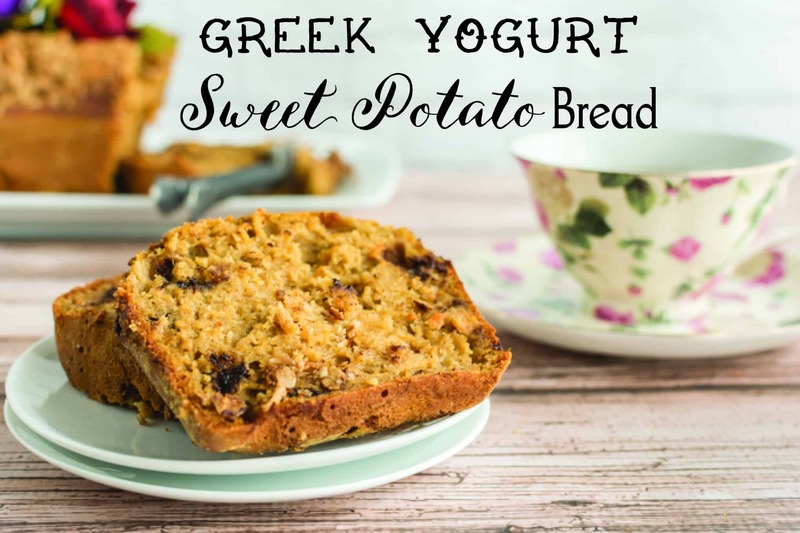 Greek yogurt pumpkin pie dip. 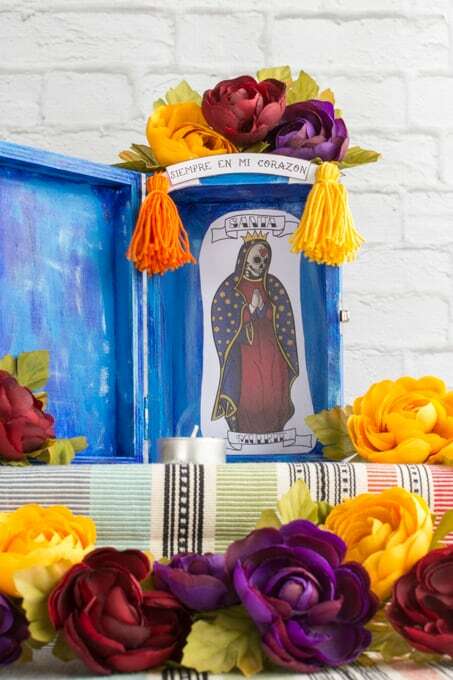 Day of the Dead Nicho (with free printables). In just a couple of weeks I’ll be headed to Colorado to experience some fall! I’m super excited about my trip, but also a little worried I’ll freeze. 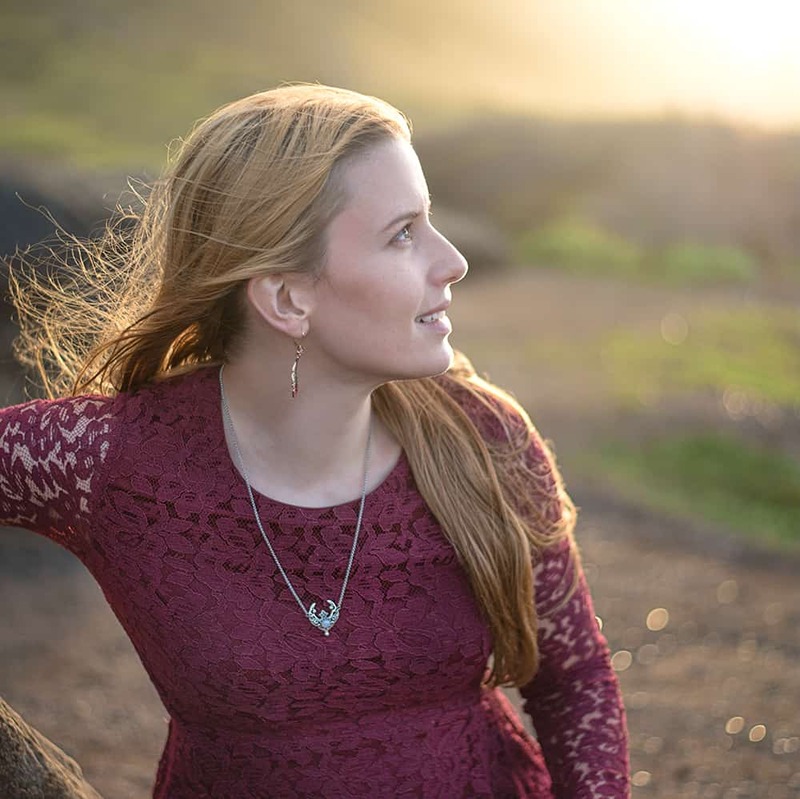 Is the weather cool yet in your area, or still holding on to warmth? This is so cute! Love it! It really is easy to customize for whatever season! ! That’s beautiful! I love sunflowers. Unfortunately, it’s still really quite hot here. Lower 90s with high humidity is to be expected for a while. To be honest, there are only about 2 weeks a year I can stand to wear jeans. Enjoy CO, that will be amazingly gorgeous!! Low 90s and high humidity is quite typical for this time of year in Hawaii. September is usually our worst month! Luckily the trade winds haven’t died on us yet this month, though, so things are still pretty nice. Or, at least, by my standards! Each year without air conditioning makes me that much more heat tolerate and cold sensitive. I just checked because I was curious – it’s currently 81 inside and I’m quite comfortable. See why I’m afraid of freezing in CO?